Upcoming Releases and Books on Sale! Choosing to go against policy, Charles risks it all to do the right thing. Will you? Watch for the special public event and launch details for 2018! The inspiration behind the creation of the Connecting The Dots With The Respect Principle concept, company, books, products, services, and global initiative. Ebooks available at https://www.smashwords.com and other EBook retailers for individuals, organizations, schools, and libraries. 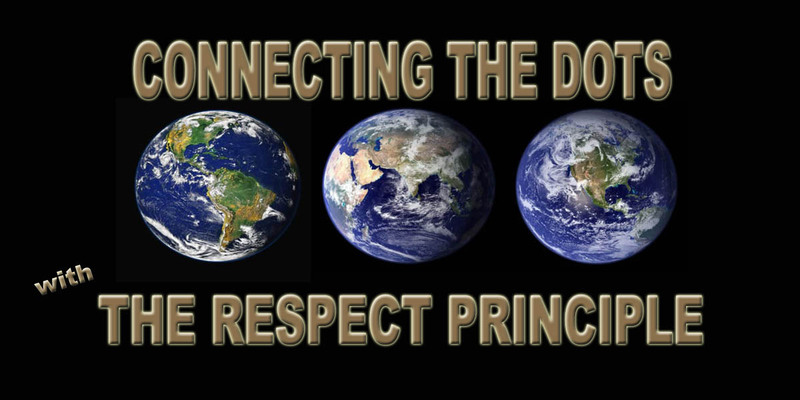 Written for readers who want to delve deeper into the justifications for adopting Connecting The Dots With The Respect Principle as a global principle to raise the standard of living and quality of life of all people. This manifesto is written specifically for those who desire to glimpse the rationale behind the “Connecting the Dots … with The Respect Principle” concept and for those responsible for helping others move past surviving to thriving. FOR JULY @ WWW.SMASHWORDS.COM 25% OFF RETAIL! Ebooks available at Smashwords and other ebook retailers for individuals, organizations, schools, and libraries. Written for the broken-hearted and/or broken-spirited, this small book, written for the global literacy level, not only speaks directly to the reader, but also provides some key higher-level knowledge in a reader-friendly format to make the logical, practical, and compassionate information accessible, usable, and motivational. Includes a mini workbook at the end of the book. FOR JULY @ WWW.SMASHWORDS.COM 50% OFF RETAIL! Print Version $14.99 US. Order direct from author using blog’s Contact Form, though ecommerce ordering coming soon! Discontinued cover, print version sold out. Print Version $14.99 USD. Order direct from author using Contact Form. The original book cover printed and published in July 2015. 100 signed and numbered, limited edition, July 2015 used for market testing. Mini workbook is included at the end of the book. Human or horse, spirits can be broken, but always there comes a time when a choice has to be made … death or life. FOR JULY @ WWW.SMASHWORDS.COM 100% OFF RETAIL! FREE! Little Jack … The Return of a Warrior? The first in the Little Jack series introduces the little rabbit who may be the one to break rabbits’ generational curse, but then again, he exemplifies the curse, so which will ultimately win … the fear caller or the warrior? FOR JULY @ WWW.SMASHWORDS.COM 50% OFF RETAIL! ONLY $1.50! The saga begins in Book 2 as Little Jack eventually accepts the idea he must venture out into the world for answers as his experiences with his new friend, Dorinda, reveal to him there is much more to discover beyond himself and the small life he has lived so far. On his own at last, Little Jack, wonders what a silly decision he has made. The idea of a quest, how absurd! Especially for a rabbit! Of course, all his thinking gets in his way of seeing what is right in front of him and he trips right over something that will again alter him. To most of the little creatures, what could be more terrifying than a wolf or a bear? Something so baffling and so incredibly dangerous that those without forewarning seldom survive or wish they hadn’t. Does Little Jack find out the hard way? In the few quiet moments of his adventure, Little Jack thinks about his family all tucked together safe and sound. He wonders what he is doing out here all alone. But he is not alone and is discovering a different way of thinking about family.